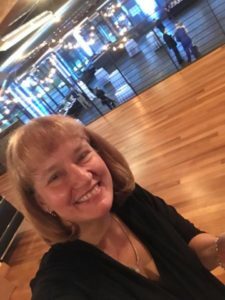 E. M. Lewis is an award-winning playwright, teacher, and opera librettist. Her work has been produced around the world, and is published by Samuel French. 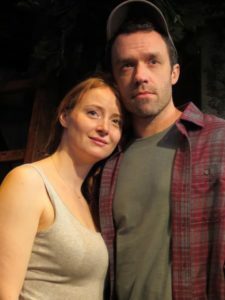 Now playing at New Jersey Repertory Theater: The world premiere of “Apple Season” by E. M. Lewis. The first of three productions in a National New Play Network rolling world premiere. Up next: productions at Riverside Theater in Iowa City and Moving Arts in Los Angeles! Upcoming: Productions of “The Gun Show” by E. M. Lewis in Tulsa, Oklahoma and Pittsburgh, Pennsylvania! 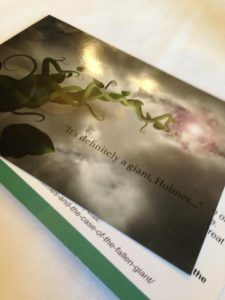 Upcoming: A piano vocal workshop of a new opera by composer Evan Meier and librettist E. M. Lewis entitled “Sherlock Holmes and the Case of the Fallen Giant” in March in New York City, produced by American Lyric Theater. 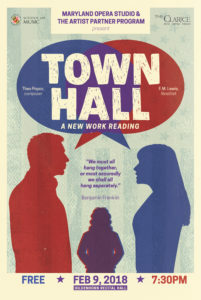 “Town Hall” — a new opera by composer Theo Popov and librettist E. M. Lewis — premiered in 2018 at University of Maryland’s Maryland Opera Studio. It will have a new production in March 2019 at Willamette University in Salem, Oregon! 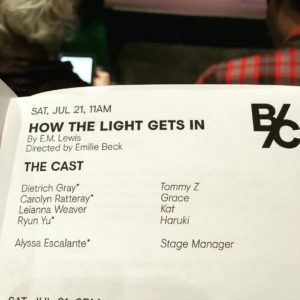 “How the Light Gets In” was workshopped in Boston Court Pasadena’s new play festival in 2018, and will have its world premiere at the theater in fall of 2019, directed by Emilie Beck!